INTERIOR RIBS - forerunner of 1908 SCALE BAND. SCALE BAND Water Set in Blue. 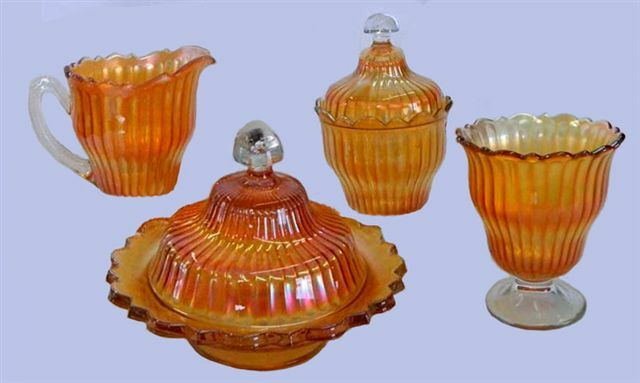 INTERIOR RIBS Water Pitcher: A marigold Scale Band pitcher is shown on page 40 - Fenton Glass – First Twenty-Five Years by Wm. Heacock. 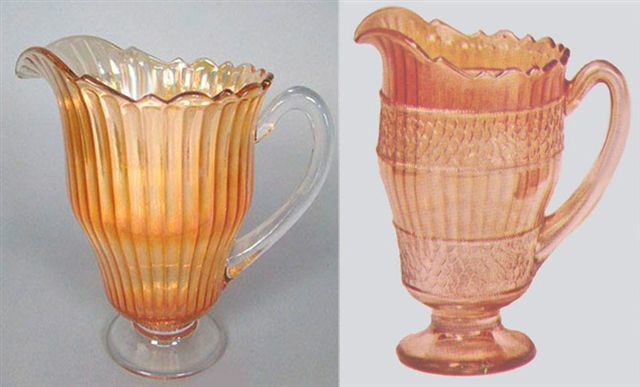 Given Fenton # 212, circa 1908, we conclude it to have begun its moulded existence as the Interior Ribs pitcher. Consider that for whatever the reason, the mould was re-worked to create the Scale Band design. 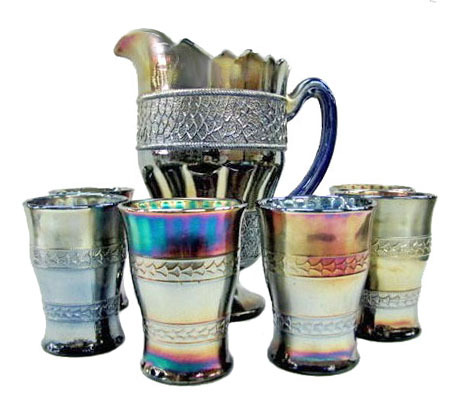 Deb Remmen advertised this Interior Ribs pitcher in a 2011 auction. SCALE BAND Water Sets: The marigold or blue Scale Band sets are scarcely ever available to the collecting world. One Vaseline pitcher is known, along with a green pitcher. Aqua/green tumblers turn up occasionally. Iridization is “touch and go” on these pieces, but then; THAT is the case with MANY rarities which bring huge sums of money in spite of it! Marigold INTERIOR RIBS Table Set in Marigold. INTERIOR RIBS Table Set: This set was in the Bob and Geneva Leonard collection for many, many years. There is no history of other than this single set, so we can assume that it was a “sample”, from which no orders were taken? In any case, certainly no production took place. DRAGON & LOTUS in Green. DRAGON & LOTUS Nut Bowl (on right). 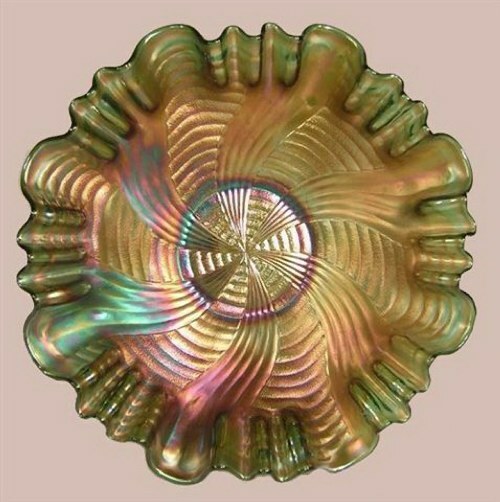 DRAGON and LOTUS: offers more variety in color and shape than any other pattern in all of carnival glass. 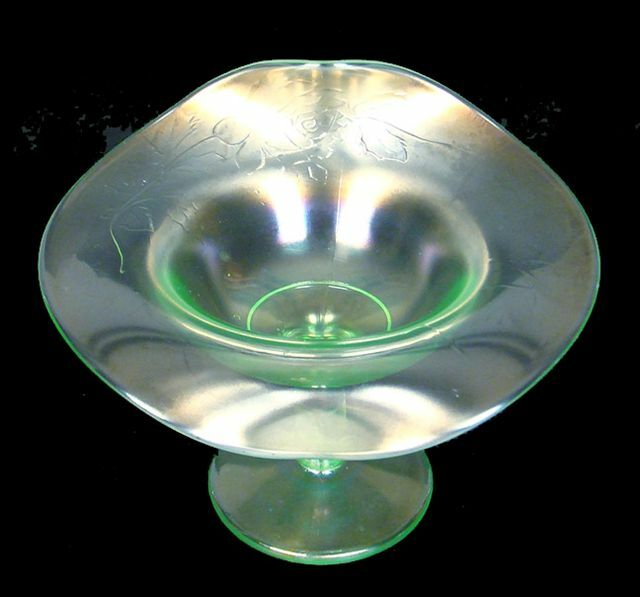 This green ice cream shape provided by Val Brooks is a “stunner”! 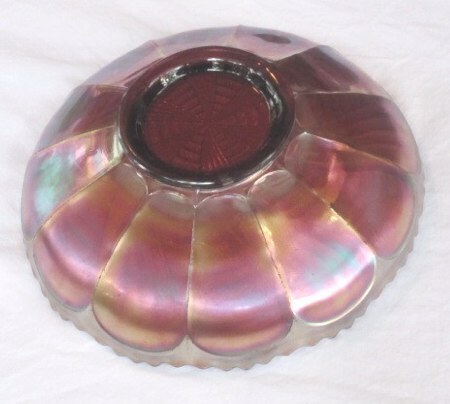 For many years the nut bowl shape was known only in a spatula footed type bowl, but since 2003, reports and verification of collar based versions have increased. Marigold, amethyst, blue, green are colors known in this shape. RIBBON TIE or COMET- 8 Inch with 3 & 1 edge Bowl in Green. RIBBON TIE - Electric Blue. Courtesy the late Casy Rich. RIBBON TIE Bowls: No “true” flat plates have been found! 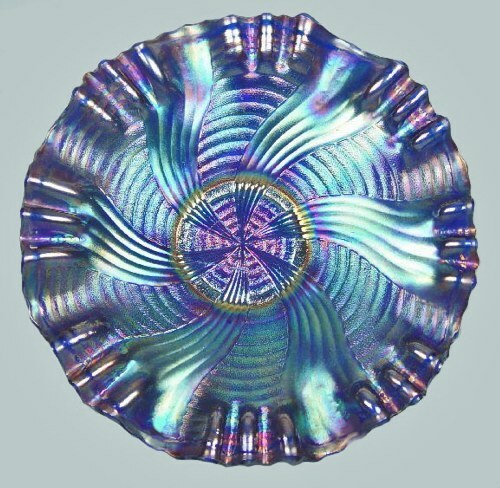 Some bowls are low ruffled to the extent that the size extends to 10”, but the edges turn up. Sometimes called Comet, the edges can be ruffled (usually six), or have 3/1 edge. Green is a scarce color. Amethyst, blue, some having a smoky blue effect, and marigold. 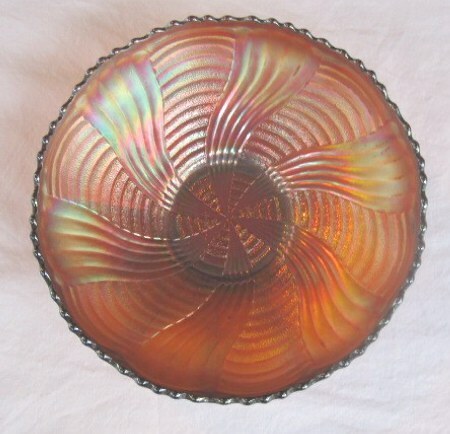 Discovery of one having “black amethyst” base glass is rare. Exterior offers the panel design. Fenton FINE RIB - footed - Vaseline. FINE RIB (footed) Vases: Ameth/Purple, blue, powder blue, clambroth, green, marigold, Vaseline and white are known colors in the JIP shape. There are ruffled styles found in marigold and white. Other Fine Rib (footed) vases may be seen in our Fenton Vases - Part 2. ROSE SPRAY JIP Compote in Ice Green. ROSE SPRAY (jack-in-the-pulpit) Compote: A goblet shape and a ruffled shape are found in marigold. 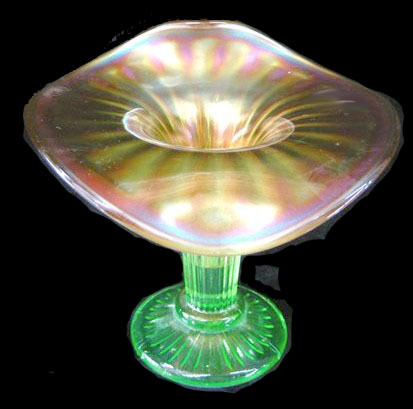 There is a flared version of the goblet shape which spreads to 3 ¾”. These are known in celeste, ice blue and ice green. The JIP shape is found in celeste, IB, IG and white. You may view several other examples in this pattern by going to --R-- in our pattern alphabet. White Grape and Cable bowl. 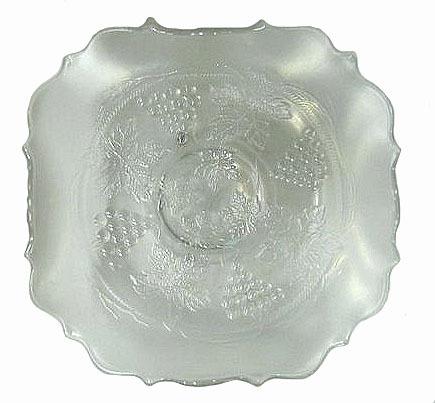 GRAPE & CABLE 7” Bowl: Fewer than a half dozen in white have sold in recent years. 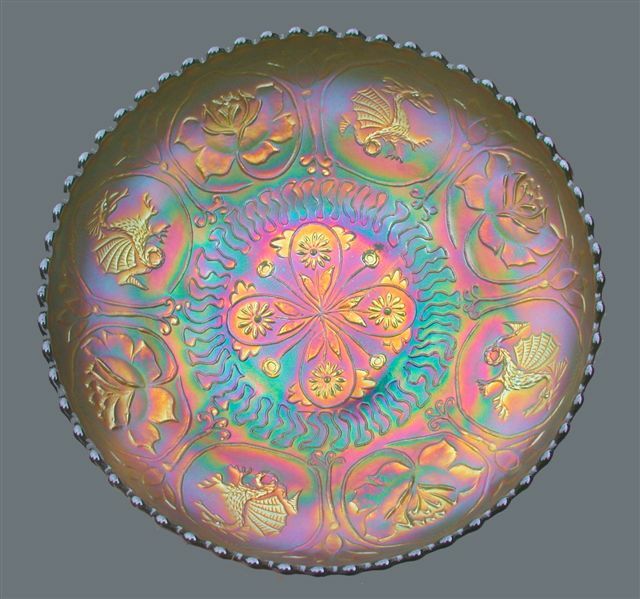 The iridescence leaves something to be desired, but many times rarities lack adequate color and super quality. Prices for the few examples sold since 2005 have been lacking, as well! Peter likened Satan to a roaring lion! How does our spiritual enemy roar, and why? Peter goes on to say, regarding the devil: “ Stand firm against him, and be strong in your faith. There are a lot of opinions about the devil.